Chick-Fest 2011 celebrates the friendship and music of Leon ‘Chick’ Freeman and John ‘Terry’ Hilliard. These great musicians have been playing music together for over 50 years. Hilliard is also a member of the Junius Courtney Big Band, who will be in concert at Yoshi’s Oakland with show at 8 and 10pm. 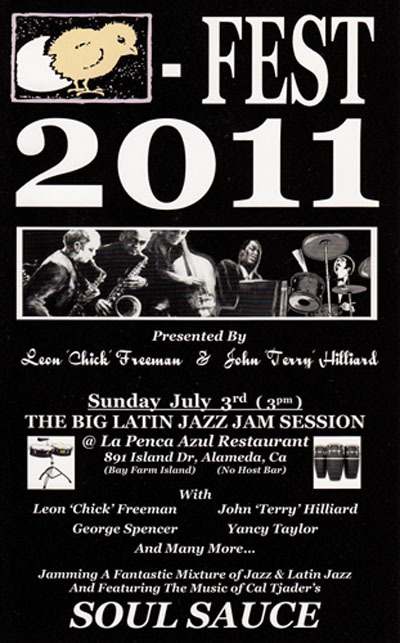 Chick-Fest will host “The Big Latin Jazz Jam Session” @ La Penca Azul Restaurant in Alameda on Sunday, July 3 at 3pm. This entry was posted on Monday, June 27th, 2011 at 11:31 pm. It is filed under Music News/Info and tagged with Chick-Fest 2011, jazz, John 'Terry' Hilliard, Junius Courtney Big Band, Leon 'Chick' Freeman, live music. You can follow any responses to this entry through the RSS 2.0 feed.